Choose from SIX dinosaurs: Ankylosaurus, Brontosaurus, Stegosaurus, T-Rex, Triceratops and Velociraptor! All your favorite critters from the Mesozoic Era! 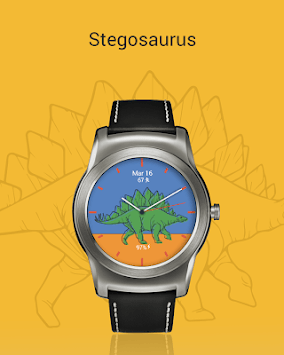 Add some fun illustrations to your Android Wear watch! All dinosaurs work on circular and square watches. • When changing watch faces, scroll to "Dinosaur Watch Faces" and click the gear icon below it. • Scroll through the six background options. • Select the background by tapping on the name. Add some fun and unique imagery to your Android Wear watch face! 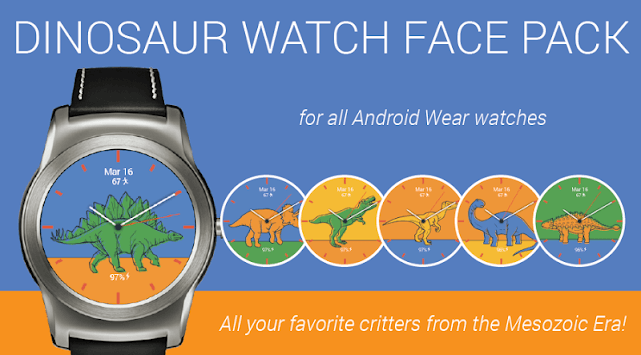 Please note: Dinosaur Watch Faces may take some time to appear on your Android Wear Watch. Be patient, it WILL show up!